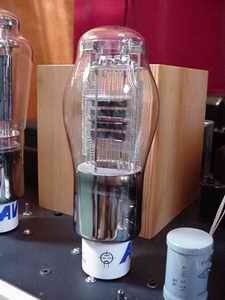 The AV325B "ref" which I am currently using as powertube, is lacking just that "airy, mystical" what the TJ300B had. 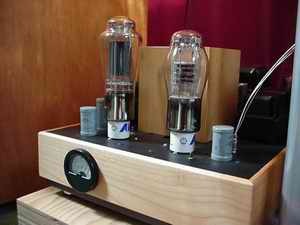 I must say, that's about all what is lacking because on all other points the AV 325B is a better powertube... When I read about the AD20M, a thought passed my mind: Could this tube add the lacking "airy-ness and mystics" to the AV 325B?? Primarily because the AD20M has a meshplate and, in my opninion, thàt is what mesh adds to the sound... I quickly contacted the distributor and a few days later he personally delivered the tubes to me (!) - How nice life can be! The filament supply is equal to the supply used for the AV 325B. Very good sound quality, using a minimum of components: Schottky rectified followed by one 10.000mF capacitor. This means a relative big ripple which is cancelled using a hum-pot. Even at an amplification of 15 at the drivers' spot, this really works well: no hum is audible! Glowing this tube is a marvellous sight at night: you can see the filament/cathode shining through the meshplate (wow). 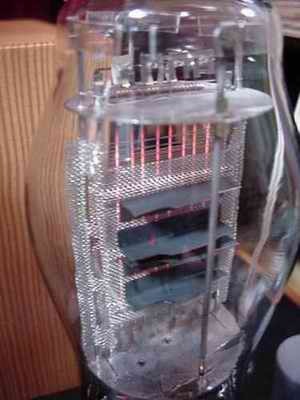 I choose for a 1K5 cathode resistor and a 100mF/100V Elna Cerafine built in wood!!. The B+ is about 325V and this results in a 28mA platecurrent, which won't saturate my (current) interstage.